Minus the torrential downpour that was most of yesterday my month at the beach has been amazing so far. Actually, the rain was amazing as well. It is so much nicer to be stuck in the rain when you don't have to navigate the streets of NYC and the subway. Nothing is worse than getting on a freezing cold subway when you feel like a drowned rat. Ok, maybe the way your feet feel after walking around in the rain in flips flops on the dirty NYC street is worse. Gross! Now that the sun has come back out I am excited to fully embrace these last few weeks of summer. Starting tonight I am expecting a string houseguests, which means lots of dinners (both in and out), trips to the beach, vineyard visits, and outdoor entertaining. 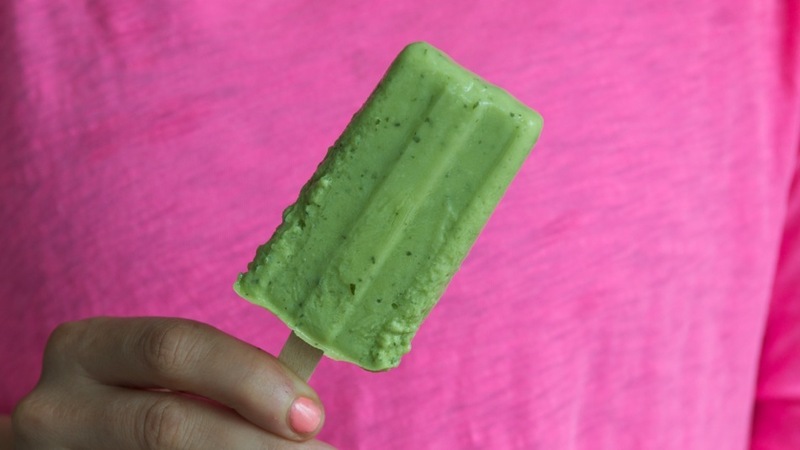 These sweet and creamy Avocado Popsicles are the perfect treat to keep in the freezer for guests. Not only are they cooling on a hot summer afternoon, but also they are loaded with healthy fat from the avocado, making them a super nutritious treat. If you can't find fresh mint, basil or cilantro would also work great with these! Adjust sweetness to taste making the mixture slightly sweeter than you want as sweetness diminishes with freezing.